Meteorite in Nicaragua: Reports of an impact are unconfirmed. Did a Meteorite Impact in Nicaragua over the Weekend? What a bright fireball looks like; this was a very bright meteor over the Netherlands from 2009. There are no confirmed videos or sightings of a meteor over Nicaragua, which is why I’m having pretty serious doubts on this story. Stories are coming out of Managua, Nicaragua, that a large bang was heard by residents there Saturday evening, and it registered on seismic detectors as well. A crater was found in the woods measuring something like 12 meters (40 feet) across. Claims are being made that this was a meteorite impact, a space rock a meter or so across slamming into the ground at high speed. 1) In a city of more than 2 million people, you’d expect a fireball around midnight would’ve been seen by a lot of people. I haven’t heard any confirmed reports of witnesses. Also, I haven’t seen any video from it either. The situation in Chelyabinsk in 2013 was different, of course, but video of that event showed up with an hour or two. I’d expect that after two days we’d have some visual evidence from Managua by now. Note: I’ve already seen a video on YouTube claiming to be from the fireball, but it’s not; it’s a bright meteor that came in over Spain. Don’t be fooled by hoaxes! There are always lots of them when something like this happens. 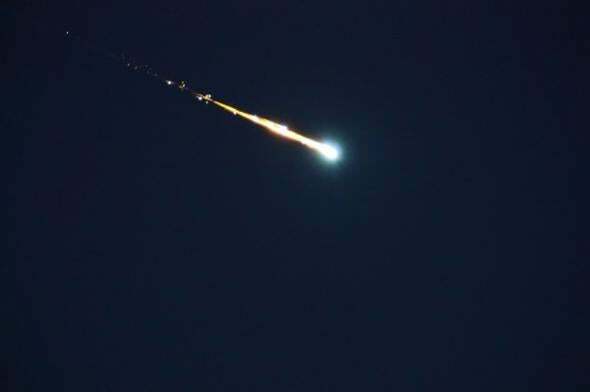 The picture at the top of this post appears in a lot of hoaxes; it was from a fireball over the Netherlands in 2009.
b) No meteorite has yet been found. If this were an impact, there should be debris in the crater, at the very least on a microscopic scale. I haven’t heard of any analysis of the soil there to look for fragments, either. I am not saying this was not a meteorite impact. I am saying the evidence for this that I’ve seen so far leaves me pretty unconvinced. I’ll note this happened near an Air Force base, too, which again makes me a little more suspicious. So my skeptic sense is tingling here and won’t be assuaged until we get much better evidence than has been reported so far. I’ll add that some places are reporting that this may have been connected with asteroid 2014 RC, which passed by the Earth on Sunday. Although this was a near miss (2014 RC got less than 40,000 kilometers from Earth), I am very, very doubtful of a connection. The asteroid passed at 18:00 UTC Sunday, which was noon Nicaragua time: 12 hours or so after whatever happened in Managua. It’s incredibly unlikely that a small piece of that asteroid was that far ahead of the main mass and still managed to hit us. The asteroid was moving at 40,000 kilometers per hour, so it was still farther away than the Moon when this event occurred. Bottom line: This may or may not have been an impact from a meteorite. At the moment, based on what I’ve seen so far, I’d bet against it … but I’ve been wrong before. Until I see confirmed video or actual confirmed meteorite fragments, I’ll remain doubtful.